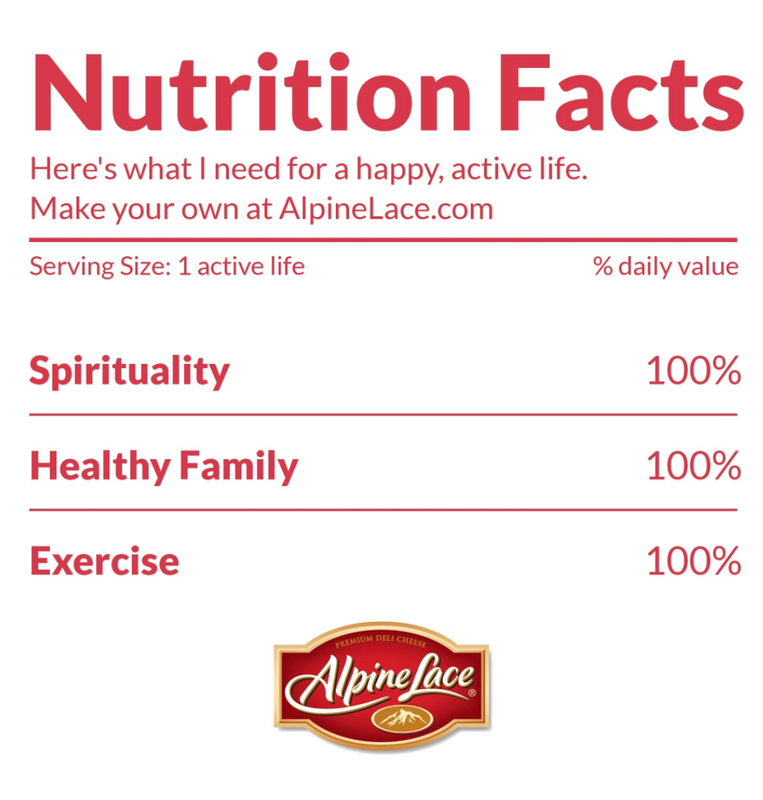 This article is sponsored by Alpine Lace®. The recipe, thoughts, and opinions are 100% my own. I am a cheese LOVER! I always add extra cheese when making any recipe with the ingredient, because I don’t think you can have too much! 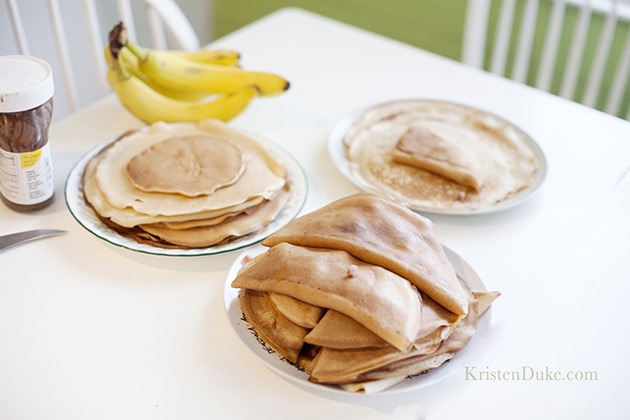 I’m excited to share my husbands most requested meal (from the kids), French Crêpes! 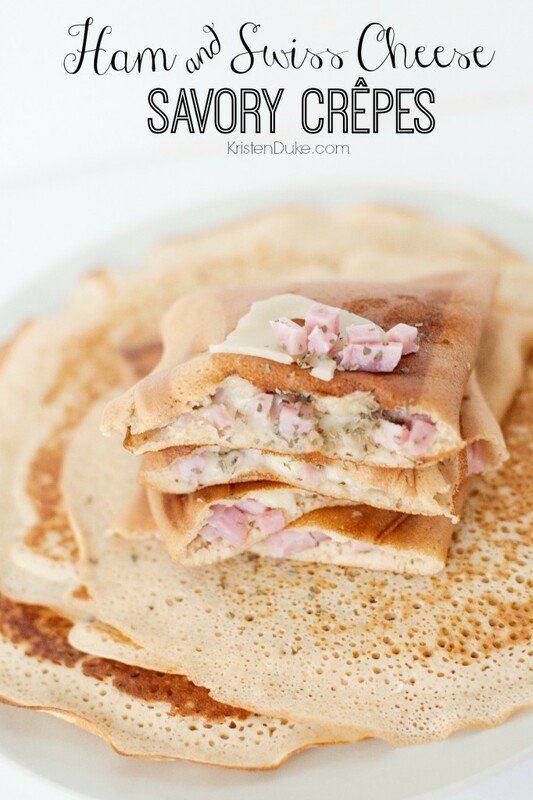 These Ham and Swiss Cheese Savory Crêpes will melt in your mouth. 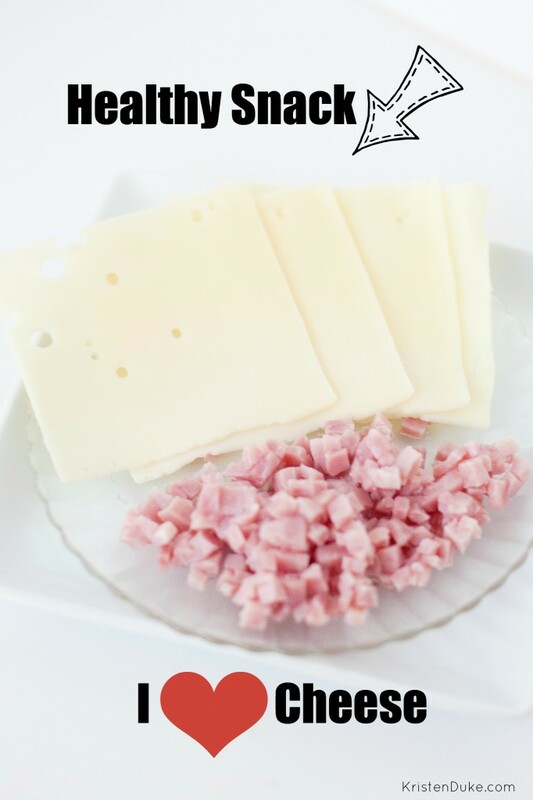 I used Alpine Lace® Swiss Cheese, which is reduced fat, using 2% milk, and can be found pre packaged by the fancy cheeses (in my local store), or in the deli freshly sliced. My husband was a missionary in France and lived there two years. He came home armed with culinary skills that would put most husbands to shame. Ok, really, it’s just a few meals he’ll make from scratch, don’t feel bad. He does a “Breakfast Jamboree” often once a week, which includes crêpes and pancakes alternating. He’s never had a recipe, just throws things together. 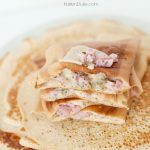 I’ve been determined to write down his crêpe recipe to share here, and finally have it! But first, lets get this right, it’s pronounced Krep, not Kraype. It may sometimes feel like you are saying “crap” but it’s ok. Be French. Say it the right way. Got it? Great. Lets move on. Now, onto the yummy part. He says the most important thing to remember is it’s a really runny batter, not thick like pancakes. If it’s too thick, add more milk to thin it out. He will first make a few crepes with nothing on them, save those for later for some hazelnut spread and banana sweetness. Then he’ll whip up the savory batch. The crepe cooks there for a minute or so, then one side gets folded over in half. Once batter is on frying pan, place cheese and ham and seasonings in the middle. Let warm 1 minute or less, flip half over (see pictures) then flip again. 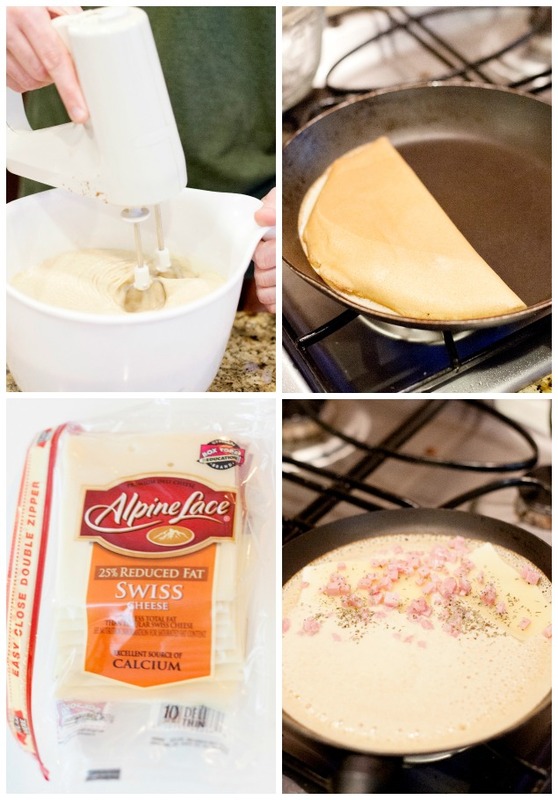 This recipe allows for 2 sweet and 2 savory crepes for all 6 in my family, so it makes a LOT. Half this if you want less. Since we used whole wheat flour this time around, it’s darker than they normally are. His crepes are generally darker than some recipes I’ve seen, anyway. It’s how we like them! About the Swiss cheese, It’s calcium-rich and a good source of protein—meaning your bones and your muscles will thank you. Cheese slices are a great balanced, healthy snack in the mid afternoon when you just need SOMETHING. If you love cheese like I do, check this out! Alpine Lace is also on Facebook! Follow to see other great cheese options for your day!